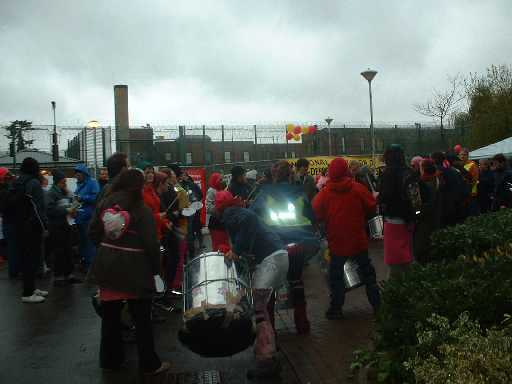 There is a demonstration outside Campsfield on the last Saturday of every month. Demonstrations start at 12 noon at the main gates, Langford Lane, Kidlington. Stagecoach bus 59 from outside Debenhams, Magdalen St, C4, Oxford at 11:15am (goes roughly once an hour) to Oxford Airport, Langford Lane, Kidlington. Arrives 11:37am. Contact info@closecampsfield.org.uk or Bill on 01865 558145 for details. 12 - 2 pm. Main gates, Campsfield House. All welcome - show your support for the detainees. Cyclists meet last Saturday of every month, 11am at Martyrs Memorial, St Giles, Oxford. Safety vests with slogans available to wear. Spread the message on the way to the demo, and get there cheaply and easily (approximately 6 miles). The Campaign to Close Campsfield meets on FIRST Tuesday of every month at 7.30pm in Oxford Town Hall. All welcome. Contact Bill on 01865 558145 or email info@closecampsfield.org.uk for details. Next meeting on Tues 5th May 2009.